There’s a reason why Jon Miller is enshrined in the National Baseball Hall of Fame. The winner of baseball’s prestigious Ford Frick Award for excellence in broadcasting, Miller combines the uncanny ability to call a play as it unfolds with the unique talent of humorous, insightful storytelling. I met Jon in the winter of 1983, the year he came to Baltimore to broadcast Orioles baseball on WFBR radio. I had heard that he could do a pretty fair Babe Ruth impersonation, and I was looking for a voice for a Babe Ruth animatron we were producing. We met in Baltimorejust before he headed south to spring training that year, and he ‘auditioned’ his Ruthian impression for me in his room at the Belvedere Hotel. I was sold, hook, line and sinker. The next day Jon laid down six short scripts at a local recording studio, and over the course of that one-hour session sound engineer Betsy Harmatz and I came to learn what a treasure Baltimore was about to embrace. In between takes he charmed us with his extraordinary wit and humor, reeling off one-liners like a baseball version of Johnny Carson. For the next fourteen years Miller was the voice of Baltimore Orioles baseball, delighting us with his calls of the 1983 World Series victory over Philadelphia, the 1989 “Why Not” season, the opening of Oriole Park, “2131” and Eddie Murray’s 500th home run. But of all his special moments in Baltimore, Jon says the one that stays with him the most is the night in 1988 when the Orioles came home to Memorial Stadium with a record of 1-23. That was when they started the season 0-21, setting an all-time MLB record for season-starting futility. That night at Memorial Stadium, 51,000 fans showed up to root on their orange and black. They called it Fantastic Fans night, and the HOF broadcaster says he never saw anything like it, before or since. 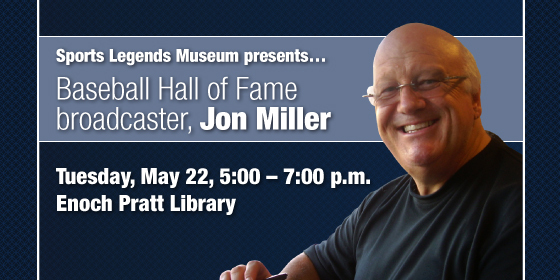 Jon Miller will be at Baltimore’s Enoch Pratt Central Library on May 22 for “Sports Legends Museum presents Jon Miller,” one of several programs our museum is doing to celebrate the 20th anniversary of the opening of Oriole Park. That night, after a meet and greet with fans, Jon will take to the stage to once again share with his Baltimore fans the sense of humor and hyperbole that landed him in the National Baseball Hall of Fame. For ticket information for “Sports Legends Museum presents Jon Miller,” call 410-727-1539.